Now that the clocks have gone back, winter has well and truly set in. But with the winter comes Christmas and whilst the excitement that overcame me when I was a kid is no more, the festive joy is still very evident albeit alcohol infused. off when having to try on dresses at the Topshop sale and can even pass for a little black dress when put together with a black top. Now I by no means have the best figure, but somehow my little friend makes my legs look fab (in my opinion) and has expanded my dress collection ten fold. 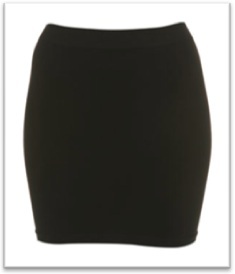 – Match it with an oversized top worn on top of the skirt which will cover the lumps and bumps but accentuate your legs. – Tuck a baggy top in and pull it out a little to create curves. – Wear it with a body. So go on and make my little friend your new best friend!